The new R1200RT headed down to BMW Motorcycles of Atlanta this morning for its 600 mile break-in service. It’s mainly an oil changed and final drive oil change along with a list of other things they check and then reset the service reminder light (which came on promptly at 600 miles). The fact that the motorcycle had about 840 miles at the time made no difference. I scheduled and appointment so that I could get it done while I waited. I had been told that the book said it was a 3 hour job but that I’d likely be out after 2½ hours. It took them just under an hour and half. No problems were found along with the service. The price was exactly what I was quoted over the phone. Now it’s time to really start riding it! Earlier today the Magic Carpet gave us not one, but two “slow” starts. You know what I mean, when the battery is weak an turns the starter slow. But later in the morning it started just fine. One slow start might be an anomaly but two in the same morning is definitely a warning. The battery was a Panasonic AGM style and was four and a half years old. The motorcycle is plugged into a Battery Tender whenever parked in the garage and it’s said this procedure greatly enhances battery longevity. But tomorrow I’m leaving for a few days in Florida with my Dad and then a week after getting back we’re heading to Maggie Valley, NC. Donna told me that she’d feel better if I went ahead and got a new battery. I thought about it and she was right. I didn’t want to stop for gas or to rest and end up having to call roadside assistance from the BMWMOA and then figuring if the dealer in Marietta, GA, Jacksonville, FL or Daytona Beach, FL was closest should the battery decide to ruin my plans. I decided to get the Odyssey PC680 battery that comes highly recommended. I got the battery at BatteriePlus where they had it in stock. It was kind of ironic that last Saturday the battery in the car went belly up too. Two things always bring up debate between motorcyclists and they are tires and oil. 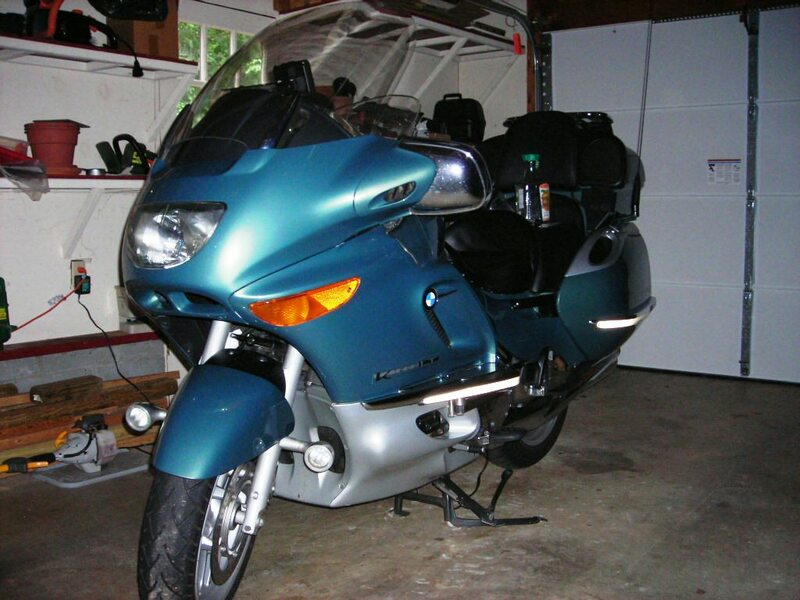 I called Tuesday and ordered the tire (he normally doesn’t have tires in his small shop for a BMW K1200LT) and was quoted a price of $151.14 for the tire. 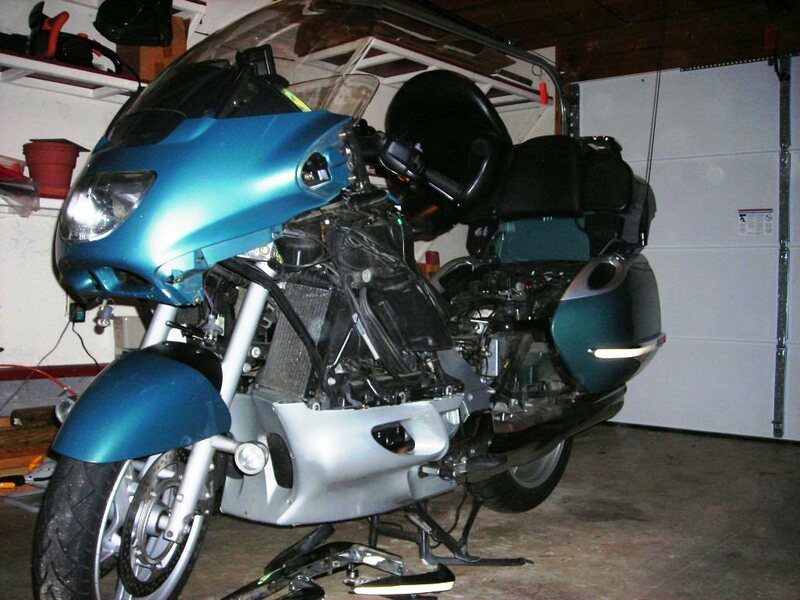 Because the rear wheel is so easy to remove on the K1200LT I was going to bring just the wheel in and was quoted a price of $10.00 to mount the tire. Yes, $10.00. Mounting when bringing in the motorcycle is approximately $40.00. The tax and fees pushed it to a whopping $14.81. On Wednesday they called that the tire was in and to set my appointment to have it mounted. On Thursday morning I went and had the tire installed. It took all of less than 15 minutes! Just out of curiosity when I got home, I checked 2 online retailers who normally have good tire prices and they did, $164.00 at one and $153.00 at the other. This was for the same tire. Ken charges significantly more to mount tires that are not purchased from him. We put 14,674 miles on the Bridgestone that was just replaced. I knew there were some miles left on it but with an upcoming trip I figured it better to replace the tire now when I could instead of when I had to. Ken said there was maybe “1,000 to 1,500 miles left on it” but agreed riding local is one thing and on a long trip is another. Our trip looks to be about 1,100 miles at minimum and that’s just to the destinations with no extra riding. I think it was a wise choice to change it now. I mean what if I put another 4oo miles on it before the trip. Maybe we’ll see about breaking in the new tire this weekend. I’ve changed all three oils (motor, final drive and transmission) a number of times on the Magic Carpet. Today I got to pass that knowledge along to another BMW K1200LT rider. Mike needed to change the three oils. He headed to BMW Motorcycles of Atlanta and they set him up with just the supplies he’d need, including the crush washers. I headed over to Mike’s house this afternoon and we took care of it. The motor oil is always pretty straight forward. The final drive is pretty easy. The hard part comes in with the transmission oil. You need to remove exhaust braces, a belly pan and have little room to work. But in a little more than 3 1/2 hours we got them all done. It felt good to show someone how to do it but most of all we had fun doing it. Toady was oil change day for the Magic Carpet. It’s normally a pretty easy thing to do. But today was supposed to take longer because every other oil change I also do the final drive oil and the transmission oil. The final drive really isn’t that hard to either, it can just get messy if you’re not careful. 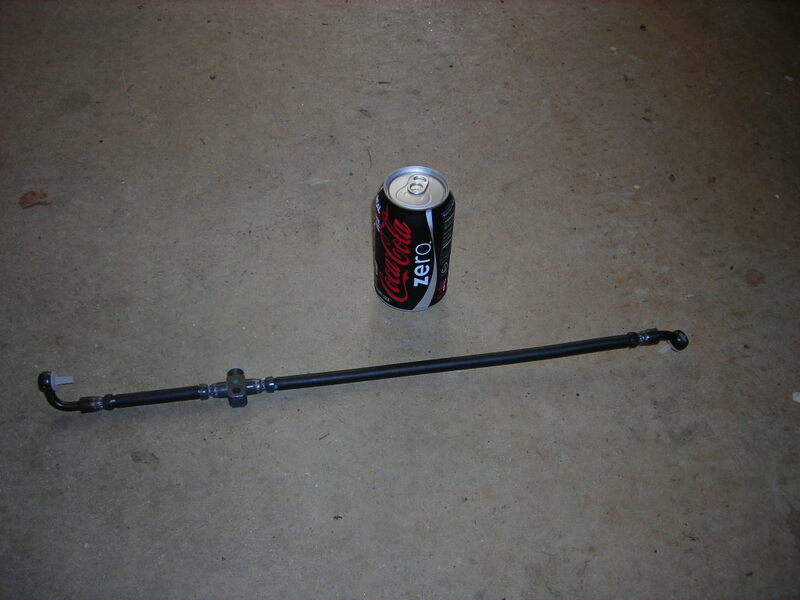 For the final drive oil I had use one of my homemade tools to make the job easier! It’s the transmission oil that adds all the time. 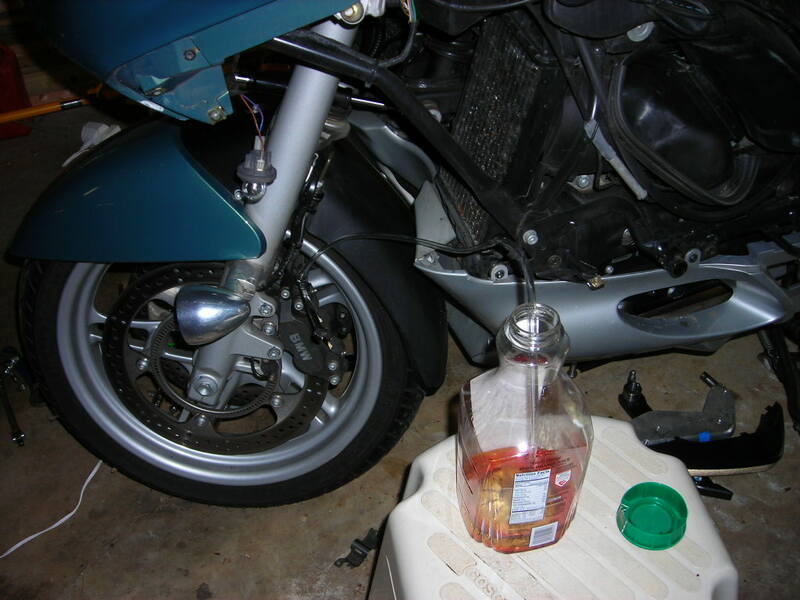 Plus since warm oil usually drains better, after doing the motor and final drive oil you need to take the bike for a quick ride to re-warm the transmission oil (or at least I do). To change the transmission oil you have to remove the skid plate, some bodywork, the driver’s right foot peg mount (the oil fill plug is behind it), and some funny looking exhaust bracket that blocks the oil drain plug. It’s like a puzzle taking it apart and putting it back together. But all the oils are changed and we’re good for another 6,000 miles on the motor oil and 12,000 miles on the final drive and transmission. Back in June when we were returning home from a trip to North Carolina the front brake line on the K1200LT developed a small leak in the front brake line. We made it home with no issues but in the last few miles I began to notice a different feel in the front brake lever. I ordered a new front brake line from BMW Motorcycles of Atlanta and it arrived this week. I spent the last 2 days doing my repair and cleaning up. Well, actually today was just spent putting the body panels back on the motorcycle. My plan was to replace the leaking line, then bleed the air out from the replacement and then flush the entire ABS system. Flushing the ABS system is a maintenance item that should periodically be done anyway. In the past I had flushed brakes but this would be my first time replacing a line and therefore intentionally introducing air into the system. To replace the line easily I was going to have to remove the fairing from the motorcycle, or the parts referred to as “Tupperware”. I’ve removed all these parts before during a 24,000 service so I wasn’t scared. Usually I have to remove the engine spoiler and lower fairing, but not this time. When you follow the directions in the Clymer’s manual it all goes smoothly. It was tempting to not remove the fairing but it was obvious removing it would make things easier. First, you need to understand something about the brakes on this particular motorcycle. BMW uses a servo assisted integral ABS system. That’s a lot of big words but it means the braking system is power assisted like a car, the integral part means using the rear brake will also begin to add front brake, using the front brakes will also add rear brake and the system is an Anti-lock Braking System. It also has a front & rear control circuit (integral pump) and a front & rear wheel circuit (the calipers on the wheels). Once I got the Magic Carpet naked the brake line replacement went pretty quickly. Then it was time for the bleeding and flushing. I got a lot of information from BMWLT.COM for the flushing. My assistant, Donna, helped me for this part as you really can’t reach the bleeder and the brake lever for all of the work. While bleeding & flushing the front, I accidentally let the funnel in the brake reservoir run dry. I regrouped and we bled the air out making a foam in the catch jar and then all was good. The old brake fluid in all 4 circuits had the color of iced tea so it really did need to be changed. All 4 circuits now have that nice, nearly clear DOT4 brake fluid now. So far I don’t appear to have any error codes appearing on the dashboard either! Of course there were some “gotcha” moments too. Some of the bleeders on the integral pump were a major pain to get to. And for some reason, the bleeders on the front and the rear brakes used 2 different size wrenches. 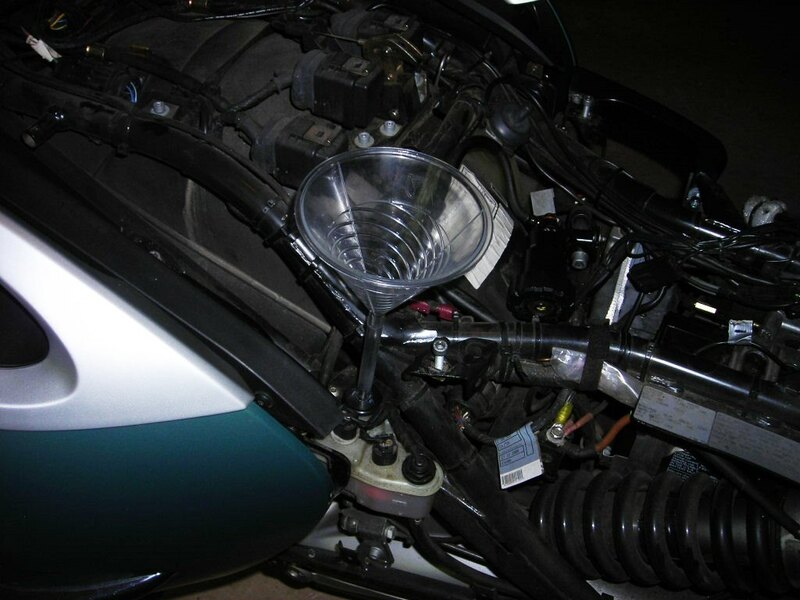 The use of the brake funnel from Beemer Boneyard made this job a lot easier too. Once the old hose was off, I looked for and found the suspected leak. I cut the hose open in both known good areas and the suspected problem area. The good area has a nice, round opening for the fluid to pass through and you could see the layers of rubber and braiding. The suspected bad area was brittle, clogged and all black. Oddly enough, I also think the bad area is where the Moto Lights had a short in the wiring and the wires had been zip tied to the brake line. The job wasn’t as bad as I had feared but it’s not something I want to do all the time. I can see why the dealer gets so much money for a brake flush though! I’ve had the Tupperware off a few times before so I have a system for keeping track of all the torx screws. But this time, when I put everything back together, I had 2 leftover torx screws. At least I’m not OCD enough to take everything apart to see where I missed putting them in. The Magic Carpet get naked! The $119.00 brake line. The can is for size reference. Flushing front brakes. Notice the color of the old brake fluid in the catch jar. The servo assist brake funnel. What a great tool! 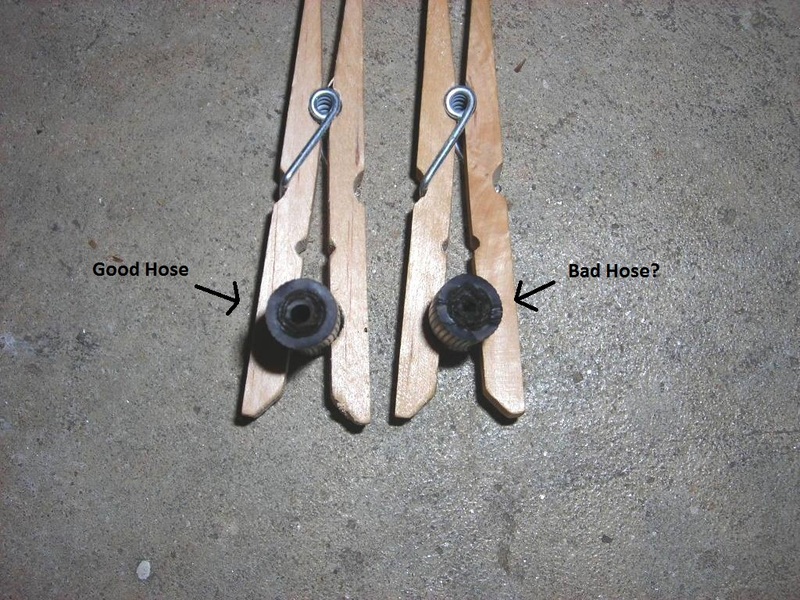 The good and suspected bad parts of the old brake line. I went down to the great folk at BMW Motorcycles of Atlanta today to order the parts I need to replace my front brake line. Yes the front brake line has developed at least one leak and I need to replace it. But give it a break, it’s been out there on the front end of a motorcycle for 10 years and 66,000 miles. I’ll have to bleed the line and may as well flush the ABS system too. And that brake hose isn’t cheap either at $118.00! The dealer had to order the long brake line as they didn’t have one in stock. The parts manager looks on the parts fiche online and tells me, “We’re in luck. There’s 57 in this country so it shouldn’t be a problem.” It should be here next week. Because I’ll be replacing that line I’ll have to remove the plastic body panels, known as Tupperware, to easily reach the top of the line. I guess I could start removing those pieces ahead of time. And as I write this the current temperature here in this part of Georgia is 102 degrees (F) as reported by The Weather Channel but my home weather station is saying 100.1. This is Georgia after all, not Arizona! ADDITIONAL NOTE: Apparently some people have thought this was a complaint about BMW Motorcycles of Atlanta. IT IS NOT! The front brake line on my 10 year old motorcycle has developed a leak. I went to buy a new one. They didn’t have it so they ordered it for me. The 4th of July holiday will add another day to the delivery. No big deal. The folk at BMW Motorcycles of Atlanta have been great in any dealings I have had with them. In the past, I’ve even been told “Before you bring it in why don’t you try this….” and “this” worked.